The rains are here, and with the mercury gradually dipping, we’re sure to see snow on our local mountains any day now. And on that note, we’ve rounded up a few ice skating venues to enjoy this winter season. Open from December 1 through February 28, 2019, head downtown to Vancouver’s classic ice rink at Robson Square. Skating is free if you bring your own skates (rentals are $5 a pair; helmets also available). Skate at Robson Square ice rink from Sundays to Thursdays, 9 am to 9 pm and on Fridays and Saturdays, 9 am to 11 pm. Note they only accept cash and skate rental ends 30 minutes prior to closing. Also be advised that warm weather leads to warm ice! Robson Square Ice Rink may need to close unexpectedly. Phone the Robson Square Hotline at 604-646-3554 if you’re planning on coming down or view their updates online. There’s no better way to experience winter than skating in fresh mountain air on an 8,000-square-foot, smooth outdoor ice skating rink high above the city! Ride up the gondola and enjoy a full winter wonderland complete with hot chocolate or bowl of chili at the Peak Chalet. Grouse Mountain’s ice skating pond is open as temperatures allow during the winter months (mid-November to April), from 9 am to 10 pm. Check their current conditions report online for details and daily activities. Vancouver’s got a new ice skating rink this year at the Aurora Winter Festival. 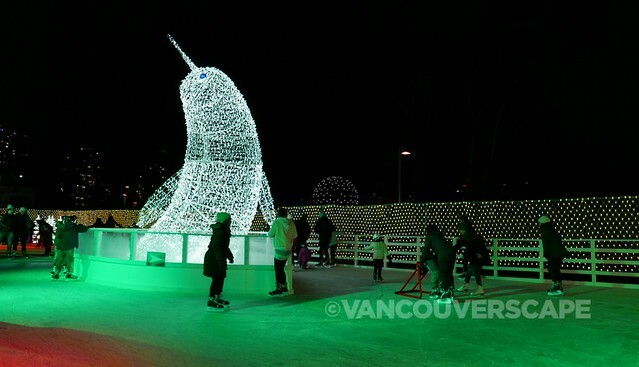 Now open at Concord Pacific Place, enjoy an ice skating session under a 50-foot-tall light dome, around a 20-foot-tall light sculpture and past a 30-foot-tall natural Christmas tree. The rink features a built-in refrigeration system, so if the outdoor temperature should rise over 10°C, the ice will stay clean and skateable. 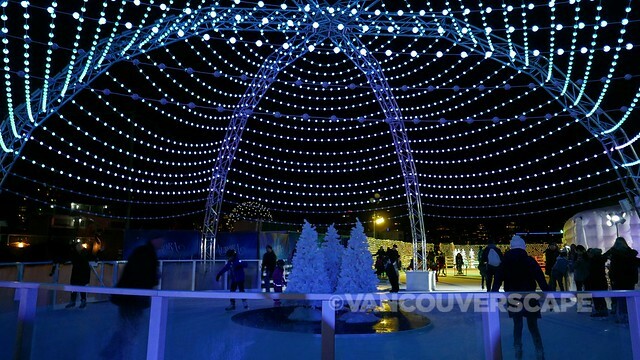 There are two islands on the ice for taking a break and people-watching, plus the rink is fully licensed, so grab a mug of mulled wine or festive cocktail while you’re here (Aurora is located close to Skytrain so you can enjoy responsibly). Skating is free, however Aurora Winter Festival visitors must pay general admission (14.99 children and seniors, $19.99 adults) to enter the Festival. Skates can either be rented or brought from home. The Aurora Winter Festival runs through Sunday, December 30, 2018.